As we come to the end of August, I was thinking back about what a whirlwind month it’s been. We started out this month in Ohio, spent a week in Charlotte, and then for the past 15 days we’ve been down at our new place in Avon Park. We spent a few days hooked up on the area they call “the hill” while we got the place cleared out, and then we moved it to storage. A couple days ago, we swung by there just to check things out and all was good there. Having the rig in storage only a couple miles from here is going to be so convenient. I still don’t want to do any pictures of the bedroom because our dresser still hasn’t come in. We called Badcock to check on the progress and it sounds like we may get it next Thursday. I am really pleased with how the room looks already. Even though a king sized bed is not the usual size for the room, it fits really well, and we have more room on either side than we have around the bed in the rv. So it feels plenty roomy to us. It will be nice though, when our dresser comes in, so we can get some of our clothes out of the closet. We’ve also painted the hall and an accent wall in our guest area/sitting room, taken out the valences over the windows and replaced all the window shades. A lot of the changes are little ones, but we really like the overall effect. This morning we worked on a change that I have really been looking forward to. As a reminder, here is what the kitchen looked like in April. There wasn’t a ton of counter space, and what there was wasn’t very functional because of the way the cabinet space was configured. Here is Harry at Easter trying to carve the ham without bonking his head or hand on the cabinet. We removed the doors to the cabinet a couple weeks ago. Today Harry first removed all the trim and paneling, so he could see how the cabinets were attached. Then he placed blocks underneath the cabinet to support it, and used his drill to removed all the screws anchoring it to the ceiling and walls. Then we carefully lifted it down onto the countertop below, and Harry just took it apart, piece by piece. I didn’t get any pictures of that last step though. I just love the open concept look. It feels so roomy. Eventually we will paint the cabinets and update different parts of the kitchen. But for right now we’re just going to do some painting, (you can see the new color on the wall), and put up a shelf on the wall to hold some pots and pans. I love how the place is coming together! First of all, just a note of support to all those dealing with the effects of Hurricane Harvey. Harry and I are thinking about those who are still in harm’s way this afternoon. Sure hope that they don’t get the amounts of rain that they are possibly anticipating! We’ve been prepping the next area of the house for painting. We have the hallway and one wall of the sitting room area taped up and ready to go. So the plan for tomorrow is to do a little more painting. Harry also finished up replacing the towel bar and other bathroom accessories to something a little less gold. We still have to paint in the bathroom, as the walls in there have more of those “lovely” flowers that we had in the bedroom. But that project is down the road a bit. 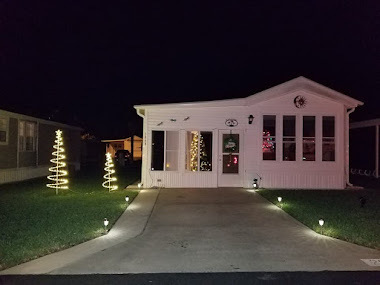 A reader left a question on the last blog post about our changing our domicile to Florida and what was involved with that. This address change has been the easiest of all of them because we were already Florida residents. We started out back in 2010 doing lots of research about which state we should make our domicile after we sold the house. We knew for sure we didn’t want it to be NY!! According to the research we did, the “best” three for rv’ers seemed to be Texas, South Dakota, and Florida, mainly due to the fact that they don’t have state income tax there, and they seem to make becoming residents a little easier for people who don’t actually have a physical home in the state. We were leaning towards FL, when we went to a seminar about choosing a state for domicile, and SD seemed to have a little more going for it because supposedly the insurance rates in FL were more expensive. So, after going back and forth, we decided to use SD. In hindsight, we would have been so much better going with our original thought. For us, at least, SD didn’t end up being very convenient. They had originally changed the law so that your license could be renewed online. What they didn’t mention was that you had to have stayed a night in the state within the year. Also the license expired on your birthday. You could renew it so much ahead of time and so much after. However, with Harry’s birthday being in Feb and mine in October, they were just far enough away from each other that we would have to make two trips to SD, in the same year. So we decided that when our licenses came up for renewal we would switch to FL. Then our plan was accelerated when our mailing service moved, and since we had to do an address change anyway, we went ahead and switched. When we “moved” to Florida, we went with St. Brendan’s in Green Cove Springs, FL for our mail service. They were really good about answering any questions we had, although most of the process was pretty clearly explained on their webpage. (We will continue to use them during the summer season to have our mail forwarded to us, as they have been very convenient, and we have always appreciated their excellent service.) When we started going through the process of becoming residents, we discovered that while the insurance was a little more expensive, the yearly registration fees were much cheaper. So it ended up being a wash. The costs involved were the charge to file the domicile documents, to get our licenses and register our vehicles (our truck and fifth wheel). That was a few years ago now and I can’t remember exactly, but I would estimate that the costs to do everything at DMV totaled around $500, give or take a little. The only thing I didn’t like about FL is that they passed a law a couple years ago, that if your address is a mail order facility, they put the registration number for the RV as your physical address on your license. While it never caused any problems, I just didn’t like how it looked on my license. Anyway, this past week, when we went to change our address, it made it really simple since we were already Florida residents. We just went to the webpage, supplied the identifying information so they could pull up our record, and changed our address – as well as giving our credit card information for the fee, of course! (Florida is really up to date on online access. It is really easy to order absentee ballots, and you can even go back in after you send your ballot back and see what date it was received.) We think we now have most of our address changes done, and it feels good to know we’ve changed our address for the last time for hopefully quite a while. The last time I wrote a blog post, I had promised pictures after the arrival of the furniture on Thursday. Sorry – no pictures yet! Because most of the bedroom furniture has not yet arrived. We were expecting our bed and dresser to arrive Thursday afternoon. So when we got up in the morning, we happily picked up the pullout couch and got everything cleared out for the arrival of the delivery guys. Around 12:30 we got a call – they had just loaded the truck and realized that they didn’t have our mattress. We were pretty disappointed, especially when we were told that they wouldn’t be getting the mattress until next week, so it will be at least next Friday before it is delivered. After some discussion, the woman offered to send a mattress from the floor to take us through to next week. So we were happy to not have to set the pullout couch bed back up. A few hours later, when the delivery van arrived, we were looking forward to getting the rest of the bedroom set up. But when Harry looked at the chest of drawers, he found that it was pretty badly damaged. It was scratched up and the drawers wouldn’t even open. So, in the end only our box spring was delivered. We had a great experience in the showroom, but so far the other side of the process has not been as impressive. We’ll see what this week brings. We are making much better progress with our address changes. We were going to make the trip to the Florida DMV to get our addresses updated on our license. In preparation for that, Harry went online to make sure we didn’t need to bring anything with us, and he was happy to find that we could actually make the changes through the website. So we went ahead and changed our address and our new licenses will be mailed to us. We were going to go over and take a quick look at the RV yesterday. (We plan to just stop by every week or so just to make sure everything looks good.) But it actually rained pretty much all afternoon yesterday, so we will wait and go over to the storage place on Monday instead. Now that we’ve been able to slow down with the work around here, we’ve gotten back to our exercising. We walked 5 miles for the past three days. It felt so good to be out and moving! By my next blog post, I’ll try to have some more pics. Our first priority has definitely been to work on upping the comfort level. The chairs in the living room were not comfy – at all. Only one was a recliner, but it didn’t recline. When we went to the furniture store yesterday, we were so happy to hear that our chairs could be delivered today. Well, they arrived right on time, and they did not disappoint! Our other priority has been to get our bedroom put together. We have been sleeping on the pullout couch, and it hasn’t been too bad, but it’s a firmer bed than we like. I did the prep work for painting the other day, and this morning we were ready to get started. Because the rooms have a vinyl covered wall board, we had to buy a special primer called “Gripper Primer.” Harry did the edging and I used a roller to do all the inside part. I have realized that it’s so much nicer to do smaller rooms. We were completely done with two coats, even allowing for drying time in between, by 1 o’clock. We are so pleased with how it came out. We will be starting the wall color tomorrow. In fact, we got it done so much faster than we expected that Harry called the furniture store this morning to see if we could move the delivery day for our bed up to this week. Yes they could! So our new bed is arriving on Thursday. We can’t wait! This morning, as we were prepping our bedroom for the updates we want to do, I was reminded of that old saying about some processes being so familiar that you can jump right back into them, just like hopping back on a bike, even after years of not riding it at all. Over the ten years that Harry and I have been together, working on home improvement “stuff” has been a common thread…first in the condo that I had bought right before we met, then again in the condo when we were prepping it for showing, then in our house. So this morning it felt really comfortable and familiar, (like an old song we’d heard many times), as we got down to the business of cleaning our room up, spackling, taping, all that good stuff. One of the parts of the project that Harry really wasn’t looking forward to was getting those dressers taken apart, as they were attached right to the wall, and he wasn’t sure what taking them apart was going to entail, and whether removing them would do any damage to the wall. So we tackled that first. The drawers did not come out easily, but it was helpful that we weren’t trying to save it, so Harry was able to overpower the hinges and wrestle the drawers out of place. Then it was just a matter of Harry using his drill to remove the screws and take the “dresser” apart. The second one came out even easier. It only took about an hour to get rid of both of them. Yay! The other part that we weren’t sure about was getting rid of that mirror. It was glued right to the wall. Harry had never removed a glued mirror so I consulted our local expert – AKA Google. Following the listed steps, we taped the mirror with duct tape, and then Harry used shims to slowly remove the mirror from the wall. The trim that runs along the wall did not go behind the “dresser” so Harry bought some one inch trim at Home Depot and finished the trim pattern so it wouldn’t be noticable that something had been removed from there. Harry making our walls look good! In between working on our updating project, we made a trip to a local furniture store and back to trusty ol’ Home Depot (for the trim and a couple other miscellaneous items we forgot to get the last time we were there). At the furniture store, they were having a great sale, and there was only one other customer there, so I think it was our fastest trip to a furniture store EVER. We now have a couple new recliners (arriving tomorrow!) and a new bed and chest of drawers (arriving a week from tomorrow). The woman we dealt with at Badcock Furniture (who was the store manager) was nice enough to split our order into two deliveries at no additional cost. That will give us time to finish the painting before our bedroom furniture arrives. We are so excited that within two weeks we are going to have a nice new updated bedroom. Yes, 1709 days…that’s four years, eight months and six days. That’s how long Harry and I were fulltimers. It’s been a fun time but we are ready for the next adventure! For the last three days, we’ve been running around like crazy trying to get everything into the house from the rv. We paid for a site here even though owners are allowed to park on the street outside their place for two days. We needed full hookups though so we could give the place a thorough cleaning, plus it was just too hot to do anything without a/c. So for the past three days we’ve been cleaning and moving stuff. I love my nice clean fridge! Harry also washed the roof and outside of the rig. We moved piles of stuff out of the fiver. We had intended to buy some of the household items so we wouldn’t have to move things back and forth, but having to buy a new a/c unit changed our plans in that respect. Speaking of a/c unit, we have a brand-spanking new one in our place. We had to limp through two days with a barely functioning unit. By the middle of the night on Wednesday, it was completely dead. So we just turned our ceiling fans up as high as they would go and hoped we were losing a pound or two. Prepping for the new unit! The guys arrived at 7:30 yesterday morning and by lunchtime we had a fully functioning air conditioner in place. Harry also prepped the back of our place for the arrival of the cable/ internet guy today. He wanted the cable to go under the concrete so it wouldn’t get chopped up by the lawn care equipment. By 1 pm today, the rv was basically looking like it did way back in the beginning before we started this fulltiming lifestyle. Then we did our final checks and hooked her up for the last time this year. The storage lot is only a couple miles away so that is really convenient. We maneuvered the rv into her spot and went in to sign the paperwork. The end of this chapter for us – and the beginning of the next adventure!! Well, for once Harry and I didn’t have any trouble getting going in the morning. We must be running on adrenalin right now because we have not been sleeping a lot for the last week or so – too much going on in our minds I guess. We were actually out and on the road a few minutes before 8 am. After looking at the traffic congestion showing on the map, we decided to take the road less traveled and go by way of I-10 instead of going around Jacksonville and up 95. It might have been a little bit longer distance wise, but at least we were always moving. Traffic that way was almost non-existent and the only slow-downs we encountered were on 27 when we started hitting traffic lights. We arrived at Adelaide Shores around 1:30 and got set up in a site. We didn’t have to maneuver around vehicles because the area where the short-term people stay is completely empty. I didn’t get any pictures of that area yet, but will do that today. After we got the air on and got enough opened up to let the cats out, we went over to our place. We intended to turn the fridge on, the air down, and then go over to Sebring to pick up a cat tree for the cats. But when we got to the house, it was already warmer than the temp we had set it on. The fan was running, but not the compressor. We turned it off and then back on to see if maybe that would reset it. Nothing seemed to happen, but we decided to go get the cat tree, and then come back and reevaluate. Well, the cat tree mission was a success. They actually had the same exact cat tree we already have, so we bought that one. The cat tree is pretty heavy, so not something that we want to move back and forth. When we arrived back home, the place was the same as we had left – definitely not cooling. So we called the a/c place and were happy to hear that someone would be here in about an hour and a half. (You know it’s bad when you’re in Florida in August and it’s cooler outside than inside! I hope I at least lost a pound or two with all the sweating I did!) So we opened the windows and started doing what we could in the hopes that the repair guy would be able to get the air conditioner going. Well….the good news is that he got the a/c working. The bad news is the problem was due to a Freon leak and to fix it would cost almost as much as a new one. So, guess what? Yes, we are unexpectedly having a new a/c unit installed tomorrow morning. Not something we thought we would be doing this soon, but I guess we’re just getting it out of the way first thing. Once we knew that our air was back in business, we went over to the rv to get what we would need for the night, and to bring the cats back to the house. Ariel does not like change, so it took her a little while to decide to come out of her carrier. And the first thing she did was find the best hiding places. She spent half the evening running for the very back corner under the bed, or going under the table. By this time it was 7 pm, and despite being really sick of eating out, there was no way I was going to cook a meal at that point, so we ordered a pizza from the place next door. After dinner Harry got the tv out. (It was the one we used to set up in the basement area of the rig.) We were so glad that we bought the Amazon fire stick because it was nice to be able to plug that in and get the tv going. Ariel even started to relax. We got the couch bed opened up and put together. With the board support, two mattresses and a topper, it was actually pretty comfortable. Good thing because we’ll be sleeping on it for at least a couple weeks! Since yesterday was our last day in Charlotte, we took the morning to do some of our trip preparations. Harry always likes to check the tires and empty the tanks, and I had some housekeeping stuff to take care of inside. After lunch, we drove the short distance back over to Andrew and Amanda’s for what would turn out to be a really fun afternoon. Amanda took us to “uptown” Charlotte where a lot of the financial institutions have buildings – especially Bank of America and Wells Fargo. Amanda was a great tour guide as she works in one of these buildings also. The sidewalks were mostly deserted as there really aren’t any tourist destinations in this area, and all of the financial places were closed for the weekend. I could easily picture professionals enjoying these outside spaces on their lunch breaks. And on days when it isn’t so pleasant, Amanda showed us how the buildings are connected so you can travel from one to the other without ever stepping foot outside. It’s like a little town in there! As we crossed one intersection, my attention was caught by an interesting sculpture right in front of me. And since we had a few minutes before the light turned, I had enough time to notice that there was a different sculpture on each corner of this large intersection. And just by happenstance, we happened to walk over a placard on the stones which explained the four sculptures, which I was able to get a picture of also. That’s a lot of “happened to’s”, but I feel like I successfully found all the pieces of a puzzle! And it was interesting to learn a little bit about Charlotte’s history in the process. After exploring a bit, we enjoyed a really yummy BBQ dinner at a place called Midwood Smokehouse. Wow, so yummy! I had a brisket sandwich and mac ‘n’ cheese. And then we finished up with one more drink at another local brewery…Legion Brewery. Oh my. Everything was so good. And we have had our fill of eating out for some time. Today we had another uneventful trip to our overnight destination…Pecan Park RV Park in Jacksonville, FL. We are hoping to get an early start tomorrow – we even stayed hooked up, which we rarely do! Tomorrow we’ll be arriving at Adelaide Shores in Avon Park, FL!